CGDA clarification : Applicability of rates of minimum wages & contractor's profit/service charges for outsourcing of conservancy services, No. 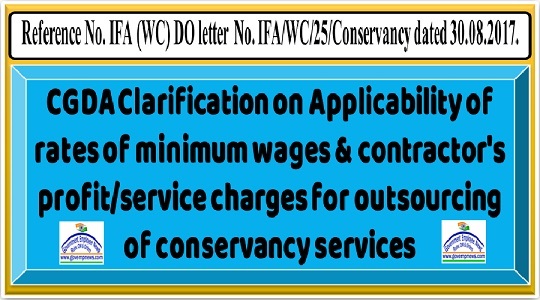 IFA/l42/Vol-I Dated:- 27.9.2017 To IFA HQrs (WC) Chandimandir Subject:- Applicability of rates of minimum wages & contractor's profit/service charges for outsourcing of conservancy services. Reference:- IFA (WC) DO letter No. IFA/WC/25/Conservancy dated 30.08.2017. Kindly refer to the letter cited above. 2. The references with regards to applicability of minimum wages notified by Central Govt/State Govt. and Contractor's profit/service charges for outsourcing of conservancy services have been examined and point wise clarification on each issues is given below for further necessary action and guidance please. All PIFAs/IFAs - for information and compliance please.